Copag cards are made from 100% PVC plastic, an ultra high performing material. They are designed to last up to 100 times longer than a traditional deck of playing cards. Red and blue cards are available. They are poker size (2.5" x 3.5") and jumbo index ( large characters ). UV marks and IR marks can be made with invisible ink contact lenses and marked cards glasses. 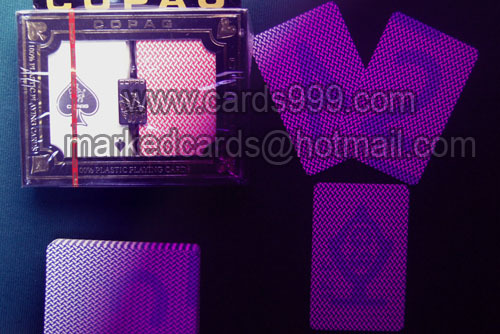 Here, all kinds of ultra luminous marked cards poker are for sale, whatever you need, you can find in our company.